Mater pauper in California. Photographema a Dorothea Lange facta. Depressio oeconomica magna fuit rerum oeconomicarum discrimen, quod totum mundum anno 1929 ineunte comprehendit. Pretia primum apud bursas Novi Eboraci collapsa sunt die Iovis, qui quidem saepe "ater" dies Veneris dicitur. Sed iam ante in Austria nonnullae domus argentariae corruerant vel aere dirutae erant. Quod illae argentariae pecuniam debebant argentariis in Americanis, ibi discrimen magnum erupsit. Adhuc in dubio est, quare discrimen illud erupserit et quare denique superata sit. Decem annis post anno 1939 secundum bellum mundanum incepit, et numerus opere carentium in Europa et America decrevit. Ambrosius, G., et W. Hibbard. 1989. A Social and Economic History of Twentieth-Century Europe. Bernanke, Ben. 1995. The Macroeconomics of the Great Depression: A Comparative Approach. Journal of Money, Credit, and Banking 27(1):1–28. 10.2307/2077848|issue=1 JSTOR 2077848. Brown, Ian. 1989. The Economies of Africa and Asia in the inter-war depression. Davis, Joseph S. 1974. The World Between the Wars, 1919–39: An Economist's View. Eichengreen, Barry. 1992. Golden fetters: The gold standard and the Great Depression, 1919–1939. Friedman, Milton, et Anna Jacobson Schwartz. 1963. A Monetary History of the United States, 1867–1960. Galbraith, John Kenneth. 1954. The Great Crash, 1929. Garraty, John A. 1986. 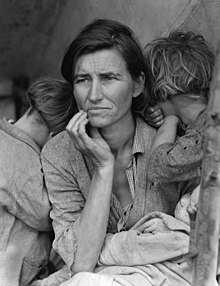 The Great Depression: An Inquiry into the causes, course, and Consequences of the Worldwide Depression of the Nineteen-Thirties, as Seen by Contemporaries and in Light of History. Garraty John A. 1978. Unemployment in History. Garside, William R. 1993. Capitalism in crisis: international responses to the Great Depression. Goldston, Robert. 1968. The Great Depression: The United States in the Thirties. Haberler, Gottfried. 1976. The world economy, money, and the great depression 1919–1939. Hall Thomas E., et J. David Ferguson. 1998. The Great Depression: An International Disaster of Perverse Economic Policies. Kaiser, David E. 1980. Economic diplomacy and the origins of the Second World War: Germany, Britain, France and Eastern Europe, 1930–1939. Kehoe, Timothy J., et Edward C. Prescott, eds. 2007. Great Depressions of the Twentieth Century. Kindleberger, Charles P. 2013. The World in Depression, 1929–1939. Ed. 3a. League of Nations. 1934. World Economic Survey 1932–33. Madsen, Jakob B. 2001. Trade Barriers and the Collapse of World Trade during the Great Depression. Southern Economic Journal 67(4):848–868 online at JSTOR. Maxwell, Donald. 2006. John Maynard Keynes and International Relations: Economic Paths to War and Peace. Oxoniae: Oxford University Press. Rothermund, Dietmar. 1996. The Global Impact of the Great Depression. Tipton, F., et R. Aldrich, 1987. An Economic and Social History of Europe, 1890–1939.